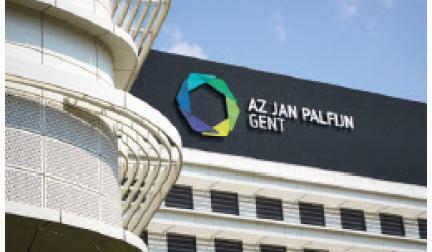 AZ Jan Palfijn Ghent is a public hospital in Belgium, with 526 beds available. The hospital is an important regional player and employs 1.000 staff, including 130 doctors. In addition to providing general care, the hospital strongly invests in various specialisations. Their number one priority is offering accessible and approachable care. Danica D’hont, civil engineer and application manager at AZ Jan Palfijn, is responsible for digitising reporting methods hospital wide. She was in charge of implementing digital dictation with SpeechReport and speech recognition with SpeechReport Cursor. From April 2016 doctors have been offered the possibility to implement one of these solutions from G2 Speech. This way of working was introduced to optimise the reporting workflow. Since 2009 the radiology department has, with great satisfaction, been using MediSpeech, including speech recognition. MediSpeech is the predecessor of our current solution, SpeechReport. Before the 2016 trust-wide roll-out, this way of reporting differed considerably from the other departments, which were still working with paper files, manually typing into an EPR or dictating on analogue tapes. The dictated tapes were delivered to secretaries who manually transcribed the reports. The medical secretariat counts twenty-five staff who produce reports for twenty-five doctors with different specialisations. About 100 doctors typed their reports themselves, filling out the EPR fields. Only a small number of cardiologists used speech recognition – from another provider – to create reports. Following the positive results experienced by the radiology department, G2 Speech was invited to demonstrate their digital dictation and speech recognition solutions. Objectives and expectations were discussed thoroughly and a project plan was drawn up. This new way of working was soon rolled out hospital-wide. SpeechReport and SpeechReport Cursor were introduced to digitise and optimise reporting methods. SpeechReport is an innovative workflow platform which helps to streamline clinical correspondence. The workflow is fully automated and reports are created with digital dictation and DPMs (Digital Pockets Memos) or our dictation app on a mobile device. With SpeechReport Cursor, doctors are able to use interactive speech recognition with microphones. Doctors are given the option between digital dictation with a medical secretary, speech recognition, typing or a combination of these methods. One thing is certain: tapes and classic dictaphones belong to the past in this hospital. The transition to digital dictation has offered huge advantages. Doctors now send their reports via their automated workflow to their secretary, who transcribes these reports. The paper stack disappears, there are no more double recordings and no more sticky notes on tapes. It’s easier to make corrections during dictations and the quality of the audio has improved. Furthermore, SpeechReport’s work list allows users to sort their correspondence based on a variety of criteria such as priority, the doctor’s name or a specific work type. All the parties involved have benefitted from the solution: the secretaries, the doctors and ICT. Turnaround times for the production of reports have reduced significantly, all of which is, of course, in the best interest of patients. Using SpeechReport Cursor, doctors are able to dictate directly into the ‘Meddos’ EPR provided by Infohos or into other software such as Microsoft Word. In April 2016 AZ Jan Palfijn Ghent started implementing this specific solution with 10 licenses. Two months on, this number has doubled. Spoken words are directly converted to written text thanks to advanced speech technology. There is also a clear difference with the doctors who are still typing their reports: due to time pressure they often only write down keywords, which means their reports are often incomplete. Using speech recognition, reports are filled out properly; as a result, the quality of these reports has improved significantly. At first some doctors were wary of using speech recognition. They believed that the available medical dictionary wouldn’t be suitable for their specialisation. These concerns have now been eradicated. The hospital manages the dictionaries themselves and is able to add or adapt words as desired. By carrying out a pre-context adaptation and delivering appropriate training, users have been able to achieve very accurate recognition and are now more than satisfied with this solution. Danica: ‘I would also like to stretch the importance of decent planning and project follow-up. Preparation is the key to success. I’ve gained the support of all the parties involved and gave end users an option on how to manage their reporting. By installing the software on their work station in a timely manner, users can start using it immediately after training. I monitor them closely and provide them with tips and advice where necessary. One by one the various departments are adopting this new way of working. As everyone is on the same page, the roll-out is easy and straightforward. People management, next to technical and practical implications, is essential. In less than two months we’ve switched from classic dictaphones to DPMs or Cursor speech recognition. I’ve been using speech recognition for several years to create medical reports, and recently the hospital has switched to G2 Speech. I write around 4,000 medical reports per year and have found this new program very accurate and easy to use, with a high knowledge of medical terminology and medications. I am able to finalise all my reports immediately without a medical secretary needing to be involved. The solution helps me to work more efficiently and the reports are generated much more quickly. Since I’ve been using SpeechReport (digital dictation) and SpeechReport Cursor (speech recognition) I’ve noticed that the administration side of things is simplified when creating reports. The speech recognition of SpeechReport Cursor has an extensive vocabulary which allows me to generate reports in an efficient and intelligent manner. Especially for urgent reports (the ones required by the patient directly), this is a big advantage. For the largest part of my reports I use SpeechReport. The workflow is straightforward, I can switch between different reports, add additional information and send the reports over the next day. A huge difference with the tapes we used to have! Extensive text can be processed in a quick and efficient manner using speech recognition. This, with the added functionality of typing additional notes, means that I am able to finalise and send the report on the actual consultation date to colleagues and GPs. For this reason I didn’t opt for classic dictation, because transcribing delays the workflow. I combine both solutions (typing and dictating) depending on the text and I am surprised at how quick and accurate the dictation is. G2 Speech has made a great difference to how I manage my files. The solution is user-friendly and I am in control of my dictations, therefore letters and notes are ready in a timely manner. By ticking this box you are agreeing to receive our newsletter which provides you with company and industry news and updates. You can change your permissions at any time by emailing marketing@g2speech.com with your updated preferences.